For fine control you may need to use Squid proxy server authentication. This will only allow authorized users to use proxy server. You need to use proxy_auth ACLs to configure ncsa_auth module. Browsers send the user’s authentication in the Authorization request header. If Squid gets a request and the http_access rule list gets to a proxy_auth ACL, Squid looks for the Authorization header. If the header is present, Squid decodes it and extracts a username and password. I am going to assume that squid is installed and working fine. 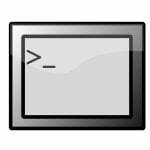 First create a NCSA password file using htpasswd command. htpasswd is used to create and update the flat-files used to store usernames and password for basic authentication of squid users. auth_param basic children 5 : The number of authenticator processes to spawn. auth_param basic credentialsttl 2 hours : Specifies how long squid assumes an externally validated username:password pair is valid for – in other words how often the helper program is called for that user with password prompt. It is set to 2 hours. http_access allow ncsa_users : Allow proxy access only if user is successfully authenticated. Now user is prompted for username and password. authentication using ncsa_auth run with proxy transparent ? Is htpasswd is available for download for FreeBSD. (pkg_add requires many components) Is their anyother way to generate password file like htpasswd? Awesome article btw! Got me up and running with no problems! Thanks! when i want to use ncsa, and i’d like to use htpasswd to create username/password, this command is not found. where do i have to find the htpasswd command? i’ve succeeded installing the apache, and i can use the htpasswd command. i also followed the above instructions to have a NCSA-style username and password authentication. i’ve reconfigure my squid.conf file. but when i try to browse sites through internet explorer, the authorization doesn’t come up. Note: i already set the “lan connection + proxy” option. i hv configure with your above instration and i am able to get popup for user name and password. after entering password it is not loging it is not autorised. when i check the access log file the follow error are there. hey !! i had problems with the iptables…. so check it I hope it will solve ur issue. What I have done,I have configured only squid.conf with following line , I hv not configured iptable , firewall. hi ,, you can refer the http://www.visolve.com/squid/squid30/externalsupport.php#auth_param for the detailed reference of you configuration. one more thing check the access given to squid_passwd. for your prompt reply , I want to tell you more thing I hv not installed squid separately I hv installed linux with squid and that /etc/squid/squid.conf I am using. sorry for the delay.I was busy with my work.so Any how what u have done is correct.check the log.and let me know. 192.168.1.*. in not then i think you have to still play with ACL. i configure my squid file as you describe but when i try to browse sites through internet explorer, the authorization doesnâ€™t come up. You guys rock, thanks very much! i’ve configured my squid as above, but squid cannot start anyway, can you trace where my fault is? 2009/01/30 02:16:07| Can’t use proxy auth because no authentication schemes are fully configured. Squid Cache (Version 3.0.STABLE10): Terminated abnormally. As a newbie to linux/ubuntu/squid it was an excellent help. How do you control auth user for blocking some host, i try to limit with acl but it won’t work. When i am trying to open any ineternet sites, the browser is asking for user authentication. When I enter my authentication, I am being able to access the internet. I am using red hat linux. Kindly tell a solution so that the browser will never ask for authentication means the browser will take my user id and password automatically and should not ask me. I am opearated behind a proxy server. Invalid Proxy Auth ACL 'acl ncsa_users proxy_auth REQUIRED' because no authentication schemes are fully configured. It is help full but in the same authuntication can’t get complete user details like from time to time uses for the need use other tools for compile the logs. I’ve the same problem than Hedwig, i followed the instruction (and it succeed). however, when i try to browse sites through internet explorer, the authorization doesnâ€™t come up. End-Users -> Antivirus Gateway -> Squid -> Internet. I have done almost all works. I could do authentication well. but one more scenery. 2. 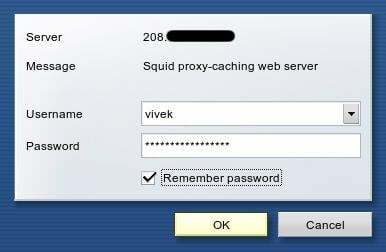 Antivirus (CA gateway security) gateway need no authentication from Squid. Its traffic should pass Squid tranperantly. ie, for only one sysytem (ie for gateway server) squid should not pose authentication windows. Is there a Keyword “NOTREQUIRED” (to use along with proxy_auth). I have a Linux server & under that i have 150+ client, i want set authentication user name & password of a website in proxy. Just example my http://www.abc.com website login user name :test & password :test123 , when any client brows www,abc.com then it automatically login that site no required to put user & password. i want a server that i can use to connect workstations to the internet so that whenever any user tries to connect even with a computer not part of the workstations (such as a laptop via wireless), the user inputs a username and password earlier assigned to the person. please can squid proxy server do that? There is a way to get only htpasswd program. Another great simple to the point guide. Iâ€™ve the same problem than Hedwig, i followed the instruction (and it succeed). check your permissions on /etc/squid/passwd file – proxy or squid should be able to read it, and if you are not running squid as root authentication is going to fail. search for bind. this is DNS server for Linux.. This only Authenticate user account. But what about ACL on different user/admin? yeah i got it running! but how can i restrict user account to use only once. because the username i created can use multiple times… like if the account is already in use.. the next user with the same account well be denied..
Trye username and password from lover case letter. To others who failed to get the authentication to work, maybe you should check your cache.log files. At first, the authentication was not working on my server, however after checking on the cache.log file, i found out the password file name was wrong. Thanks for the help everything is running awesome!!! nice artical but please any guide me how can I encrypt the clear text password user getting it with sanffirs. Guys..if you cant get the authorization to come out, please try this. Aug 26 23:12:49 centos1 squid: The basicauthenticator helpers are crashing too rapidly, need help! Guys any body please update on this issue. I am getting tcp_denied/407 error . What should I do ? I dont really know why but it worked for me. I spent many hours until I accidentally found this out so I hope this helps somebody. Followed the example and got the proxy authentication to work successfully…. This is a very nicely written example of how to get started. The only thing I had to do extra, was to install a package that would allow me to run the “htpasswd” command. and thanks for the explanation, it help me to finish my report . . .
We are using squid proxy authentication using samba. Users are given there username and password to authenticate in browser. Only issue is that it accepts the authentication even if user enters â€œspaceâ€ as username and password, can we prohibit empty space to be accepted in authentication. How you have customized the Username Password authentication login ?? You should not *append* auth_param, but should insert it *before* acl part. Otherwise you will get FATAL error when trying to start squid. [26:25] Error : connection to the proxy server was closed unexpectedly. Please make sure that the proxy server protocol and address are correct. I my having network that used proxy with authentication. Is there anyway I can store the proxy server name, username and password in this conf file and then just use the IP address of that machine for accessing internet over other machines directly. can we change the location of password file from /etc/passwd to any other thing? When using basic_ncsa_auth, does it send password on the very first prompt in plain text and subject to man-in-the-middle attack, right? I have a problem with configuring squid 3.1. I have several outgoing ips and i created same amount of users. I want to setup squid so that one user can access to only one outgoing ip. Users use authentication (login/pass) so i tried to make one acl by one proxy_auth. But smth is wrong. internet_users contains user1 and user2 with passwords. But when i try to connect to proxy server like user1 and after this like user2 squid redirecting me on user1’s outgoing ip in first and second time too. But in the second time squid must use user2’s outgoing ip. Can someone please point me where i mistaked? I got a lot of connect and get DENIED in my access log, without being prompted for the password. Just make sure your squid.conf has “`http_access deny all“` on the last line (or at least after your http_access allow ncsa_users. I had succesfuly add users by htpasswd into /usr/local/squid/passwd file. The problem is that I always get authentication dialog box in browser, but when I enter credentials, they dont pass and I get the dialog box againt to enter user/pass. 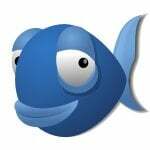 I use Slackware and Mozilla Firefox. The Squid is 3.5.16. Does anyone can help? Thank you.